Warner Bros Pictures has unveiled the official 2+ minute trailer for the action adventure film, King Arthur: Legend of the Sword. Sons of Anarchy‘s Charlie Hunnam stars as Arthur and The Young Pope‘s Jude Law co-stars as Vortigern, Arthur’s uncle. The cast also includes are Astrid Bergès-Frisbey (Pirates of the Caribbean: On Stranger Tides) as Mage, Djimon Hounsou (Wayward Pines) as Bedivere, Aidan Gillen (Game of Thrones) as Goosefat Bill, and Eric Bana (Star Trek) as Arthur’s father, King Uther Pendragon. Guy Ritchie directed from a screenplay he co-wrote with Joby Harold and Lionel Wigram. Guy Ritchie, Joby Harold, Lionel Wigram, Akiva Goldsman, Tory Tunnell, and Steve Clark-Hall produced, with David Dobkin and Bruce Berman executive producing. Warner Bros Pictures is planning a May 12, 2017 theatrical release. 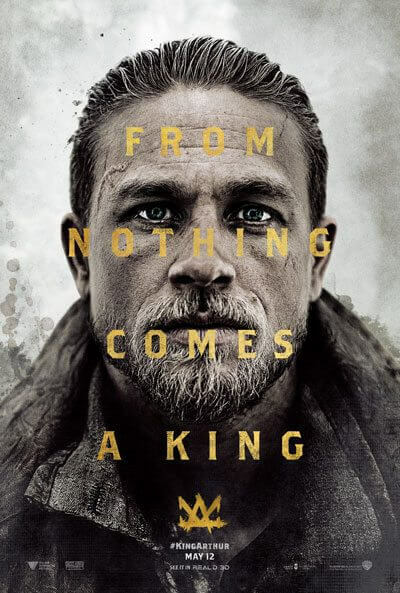 The Plot: The King Arthur story introduces a streetwise young Arthur who runs the back alleys of Londonium with his gang, unaware of the life he was born for until he grasps hold of the sword Excalibur—and with it, his future. Instantly challenged by the power of Excalibur, Arthur is forced to make some hard choices. Throwing in with the Resistance and a mysterious young woman named Guinevere, he must learn to master the sword, face down his demons and unite the people to defeat the tyrant Vortigern, who stole his crown and murdered his parents, and become King.